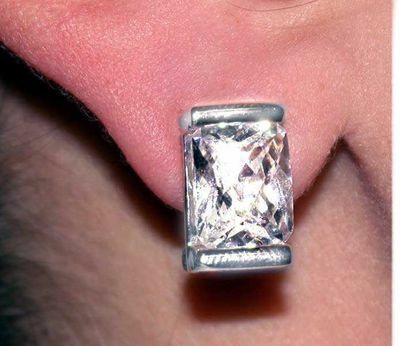 Clutchless Cubic Zirconia Pierced Earrings. The Stone is 7/16" Of An Inch High & 5/16" Of An Inch Wide. Even Your Jeweler Will Say, "Diamonds!" Our finest quality Cubic Zirconia is a fully faceted synthetic stone which approximates the refractive index and dispersion of a diamond. Because of its higher specific gravity, a zirconia is approximately two-thirds the size of a diamond of equal carat weight. Not even a jeweler can distinguish cubic zirconia from diamonds with the naked eye. Click On The Picture To See More Detail, However Even With A Great Picture, It Is More Appreciated When You Hold It In Your Own Hands, And See It With Your Own Eyes! And That Is So Easy For You To Do. There Is No Risk To You Whatsoever. You Can Order It, & Hold It In Your Hands, Knowing That We Guarantee You Must Be 100% Satisfied With The Jewelry. If You Don't Like The Jewelry You Have Purchased, Simply Return It Within 72 Hours, Of When You Received It And We Will Promptly Refund The Full Purchase Price, No Questions Asked. "When You Buy From Costume Jewelry Wholesale Or From Costume-Jewelry-Store You Get Fashion, Quality, Value, & Service , And Our Guarantee That You Must Be 100% Satisfied".